Imagine sinking into a cushioned chair in your palm-fringed private courtyard after a long day at work, sipping on a glass of wine as a roaring outdoor fireplace fends off the evening chill. This is reality for the lucky owners of this home, who asked Sandra Batley from Flourish Gardens to create their own inner-city oasis. Sandra used a mostly white palette with occasional black accents and natural woods to make the most of the limited outdoor space, immediately declaring a mood of restrained chic with a touch of opulence. The Nikau and kentia palms around the periphery bring fresh, bold colour and a calming natural element to the courtyard, while serving the dual purpose of sheltering occupants from cold breezes. 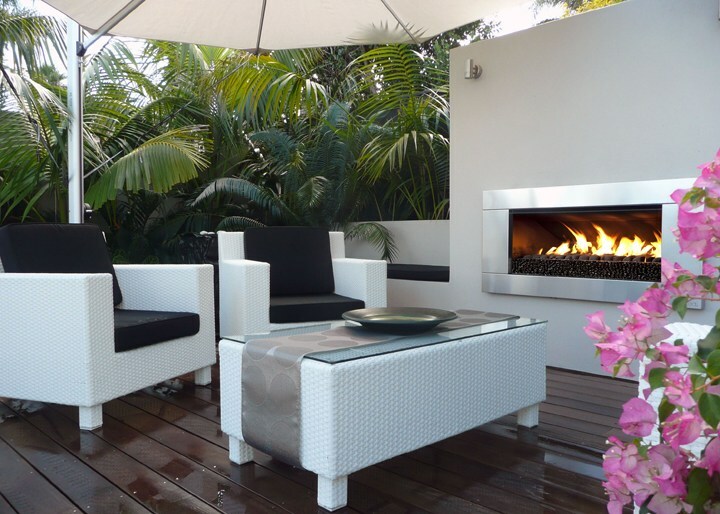 To ensure the courtyard is even warmer, Sandra chose to install an Escea EF5000 outdoor fireplace. The fire’s stainless steel slab fascia reflects the area’s clean lines and fresh colours, maximising the space. The fire itself further enhances the feel of having room to move – the depth and natural look of the flame pattern that is an Escea trademark gives the entire courtyard an inherent sense of permanence and depth. The EF5000 heats the outdoor space with incredibly efficiency, warding off the creeping cold of even the bleakest winter nights. 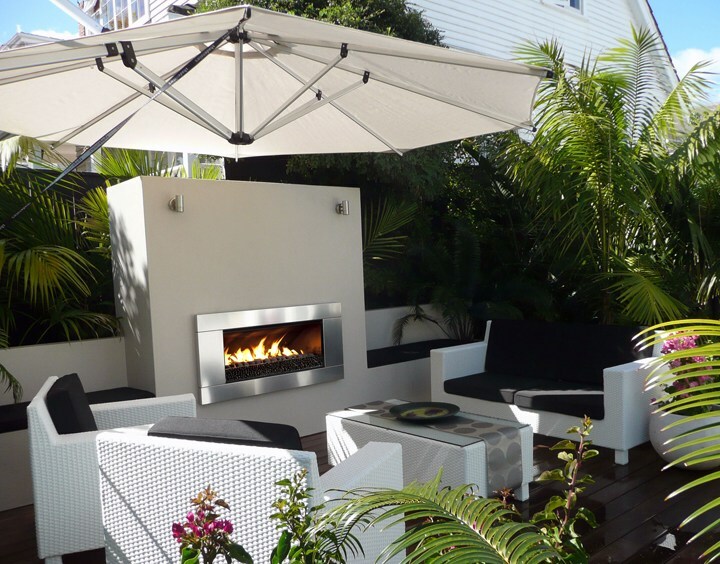 It is rated zero clearance, meaning it can be installed into any space without expensive fire-proofing – perfect for this courtyard, where the fire is built into a concrete retaining wall. 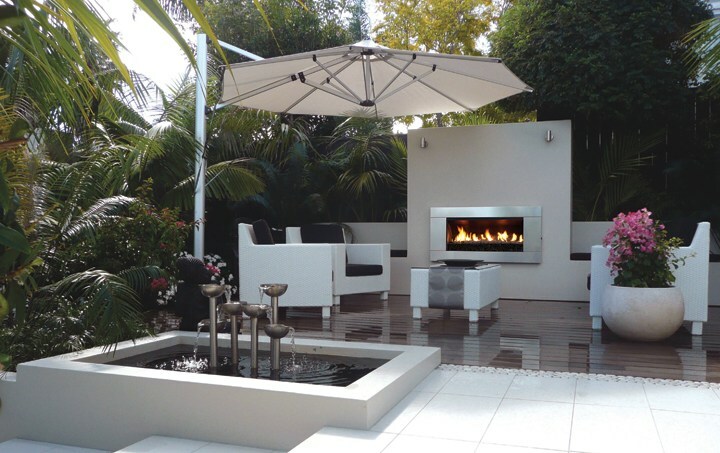 Any outdoor space benefits from the minimalist lines and radiant warmth of an Escea EF5000. To read more about the fireplace’s features, visit www.escea.com/ef5000. To see more of Flourish Gardens’ projects, visit their website here.